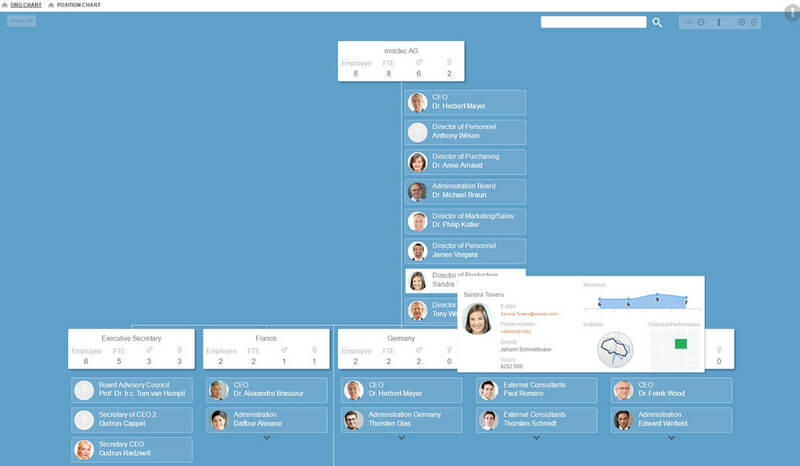 Powered by a fully automated process, Ingentis org.manager calculates personnel and company key figures and visualizes them within the org chart, facilitating your HR analytics. Be it headcount, gender distribution, demographic analysis, manning quota, budget comparison, target-actual comparisons or absences – Ingentis org.manager provides you with clearly organized HR reports based on diagrams and tables. Aside from data drawn from a personnel management system like SAP HCM, information from other divisions such as Finance, Marketing or Production can also be used. 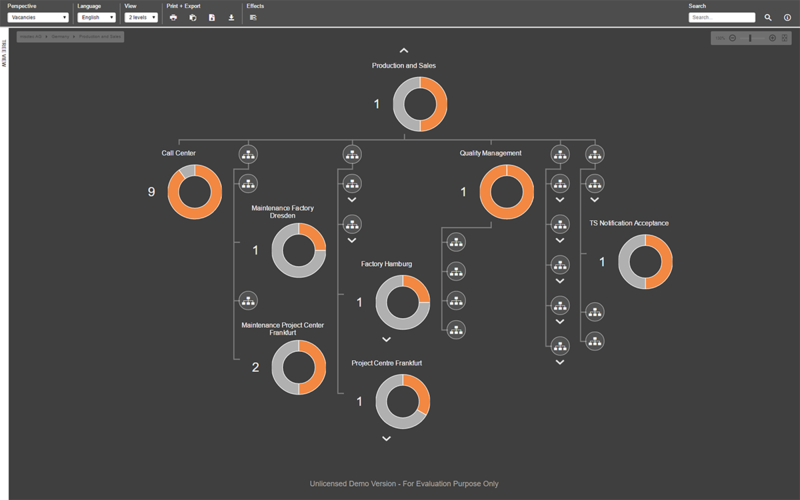 This way org charts become an effective strategy tool for workforce analytics. The integrated diagram function allows you to show performance figures, including occupancy rate, budget compliance and many others, as part of your organizational chart in a graphically-prepared format. There is a wide range of diagrams (e.g. bar chart, pie chart) to choose from. Finally, you won’t have to draw your diagrams yourself anymore! Visualization rules – Highlighting what’s relevant! 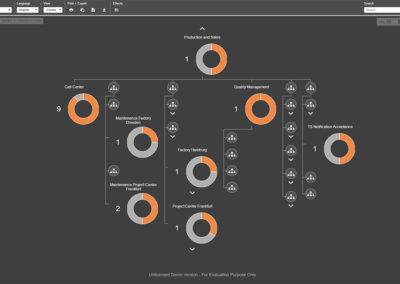 Individually defined visualization rules allow you to determine how each organization unit, position or each employee are displayed based on arbitrary data. For example, would you like to focus on all departments accross your organization where the vacant positions exceed the number of 3? It just takes one click to highlight the objects of interest, based on color coding. It’s also possible to bring your org charts to life with symbols and icons. Make use of the visualization rules and replace certain values with symbols, e.g. to point out first aiders or other special details of a person, position or org unit. 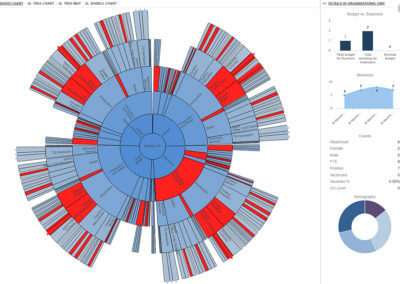 Did you know that it’s possible to present big data in a clean, compact way with the Ingentis org.manager tools? The software displays great amounts of HR data with the help of charts and diagrams such as the sunburst or the bubble chart. In addition, specific parts of these charts can be highlighted with the help of rules and filters. 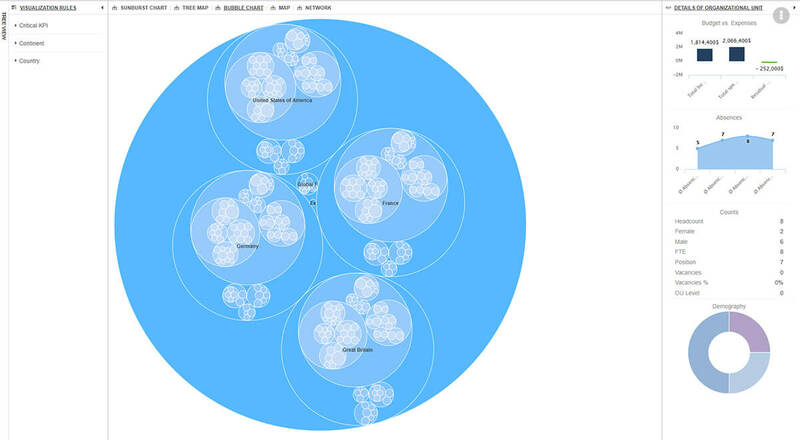 The sun burst chart is one of several options to visualize big data. Analyzing absences is one of the most important figure for executives and HR managers. 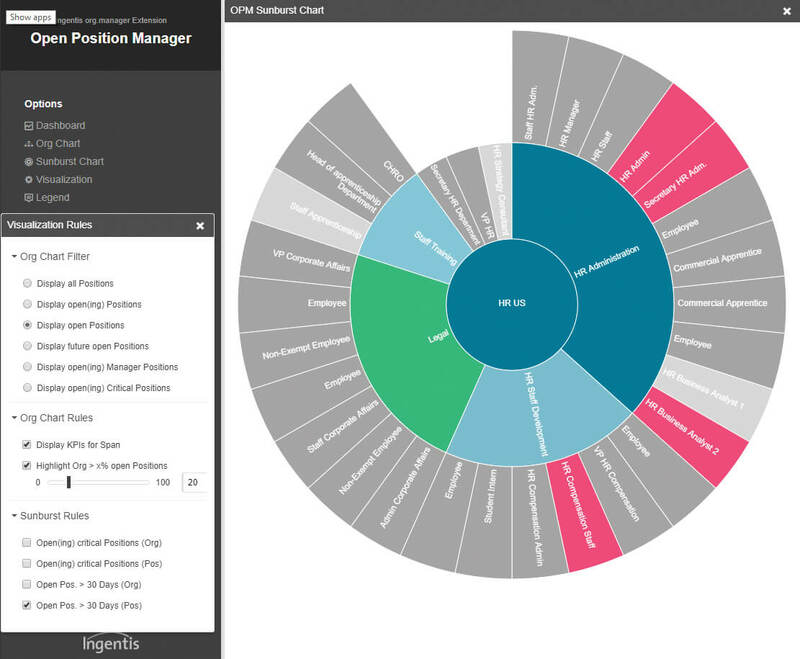 Ingentis org.manager allows for a comprehensive overview that highlights trends and areas where action is required. Ingentis org.manager calculates KPIs within seconds – be it for the complete organization, a single org unit, or for part of the hierarchy structure starting from a certain organizational level downwards. 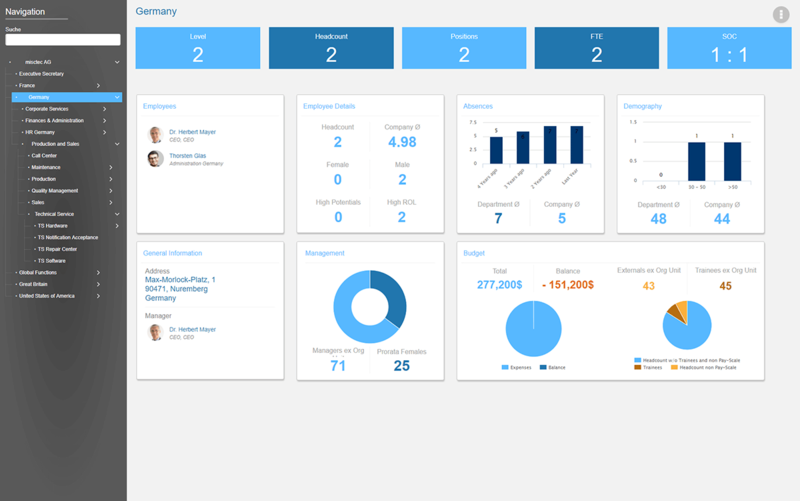 The customizable dashboard view of Ingentis org.manager displays typical KPIs such as gender distribution, demography and budget balance. Regardless of the nature and number of systems you want to take and merge your data from, thanks to numerous standard interfaces Ingentis org.manager is a true ‘Data Warehouse‘. This means, that aside from data drawn from the personnel management system, information from other divisions such as finance, marketing or production can also be used. The access protection add-on allows you to decide which information should be available to which employee via the web browser. 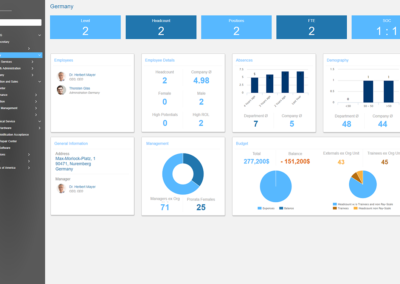 The freely-selectable arrangement of content also permits the creation of a Management Cockpit or Dashboard. Vacation days, details for shift planning, overtime and absences or qualifications can be shown in a compact, up-to-date format. This allows you to easily create your own ESS/MSS portal. When performing reorganizations, mergers or acquisitions, it is important to assess the impact of various possible hierarchy structure scenarios on the performance indicators. After the organizational structure is modified or values such as the personnel costs for a position are adapted, all KPIs are calculated based on the new constellation at the push of a button. Visit our org.manager demo to check out its rich feature list. There, you’ll also find several perspectives that illustrate how to visualize important KPIs. For example, the perspective “Employee List” presents the org units together with their respective key figures such as headcount, percentage of vacancies or average age. 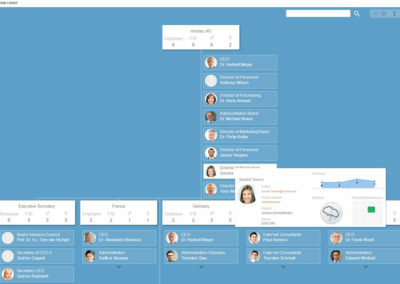 The perspective “Vacancies” visualizes an organizational structure that focuesses a single important key figure, vacancies. To top it all off, the org.manager offers the perspectives ‘Dashboard’ and ‘Charts’ to illustrate very popular ways of displaying great amounts of data in a neat way. See how Ingentis org.manager and Ingentis org.manager [web] for SF can save you time. Experience the flexibility of our software solutions. Would you like to start visualizing KPIs with Ingentis org.manager? Get in touch with us for a free trial version. Do you have any questions regarding the Ingentis org.manager suite? Are you interested in a consultation? Don’t hesitate to contact us via the contact form below. We look forward to you hearing from you!